Have you thought about what you're going to give each other as wedding gifts? It's actually a really common practice. Personally (and this is just my personal opinion, not the popular one), in today's world, I don't think the groom should give a gift to the bride. He already bought her an engagement ring and a wedding band, the cost of which far exceeds the wedding band she bought for him. Now, once upon a time when only the bride's family paid and the wedding was completely not the groom's financial obligation, it was different. But with both sides paying (or the couple only paying), I still say no gift from the groom to the bride, other than her rings. So what, then, should you get the groom? I really like the idea of a watch. 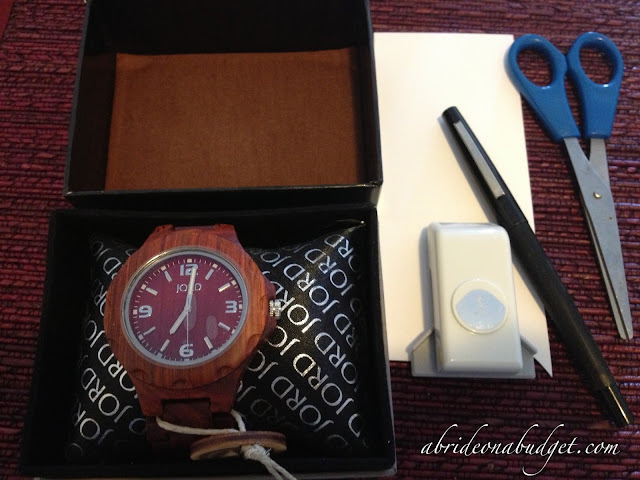 But a watch in a box, oh, that doesn't make it special. But my wedding twin Kristiana came up with a brilliant idea. Add a note ... that includes the time of your ceremony. Cue the awws. 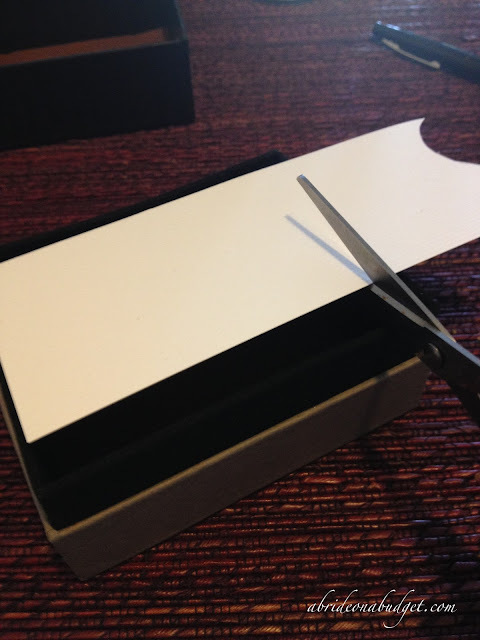 Lay the cardstock across the box and cut it so it will fit. 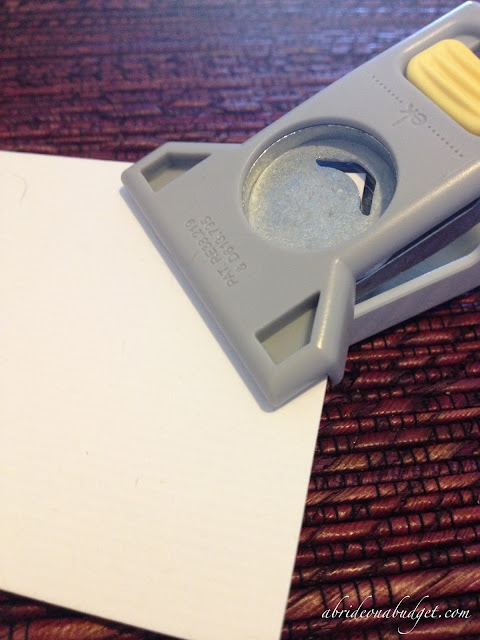 Round the corners with the mini corner rounder from EK tools (my favorite tool ever). Write your note with the marker, sign it from your (almost) wife and stick it in the box. Be sure to get this to the groom's father or best man before the wedding and have it given to the groom before the ceremony. According to the time on the watch, this took me 13 minutes total to put this together (including time to snap photos). But, I did spend a considerable amount of time writing the message in pencil (about four times) before figuring out what I wanted to say and how to space it. If you aren't as picky as I am, this will take you much less time. 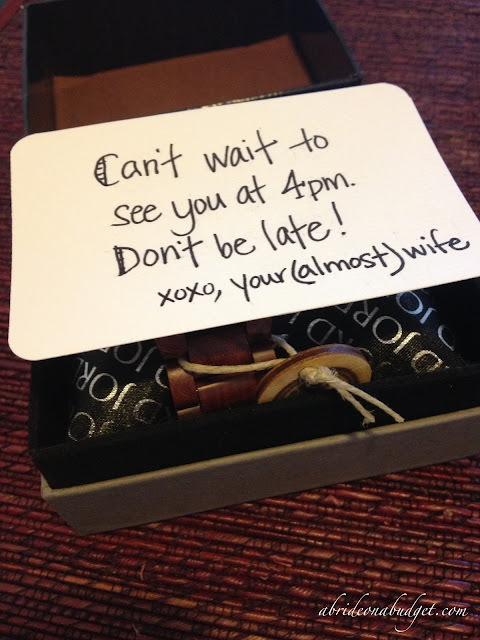 Plus, what a great way to send a cute message to your groom before you see him. 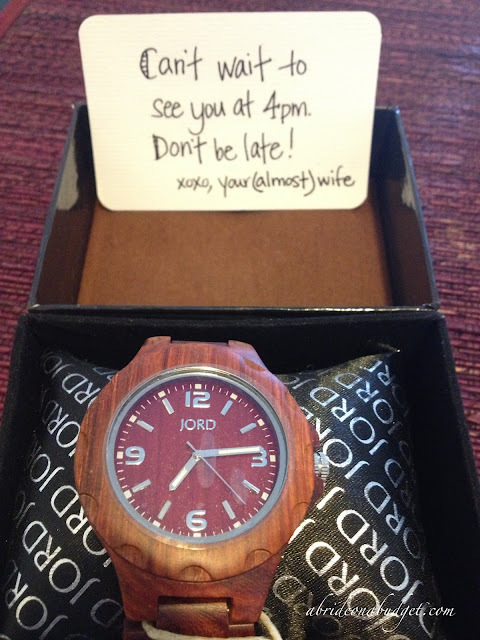 BRIDAL BABBLE: Are you planning on exchanging wedding gifts with your groom? He doesn't wear a watch but it's definitely inspiring!